Lisbon, capital of both the Portuguese kingdom and empire, had nurtured links with prominent European centers of trade, culture, and politics since the Middle Ages. Connections with Italian cities like Florence (home of the affluent Marchionni and Sernigi merchants), and Genoa were particularly strong. In Northern Europe, relevant ties were woven with Augsburg and Nuremberg in Germany and Bruges, and Antwerp in Flanders, areas shaped by the activities of “dynasties” of prominent and educated businessmen like the Welser and the Fugger. Antwerp was the center of these interactions in the early sixteenth century and the Portuguese crown soon established a feitoria (trading post) in the city. Prince Pedro (1392-1449), the brother of Henry the Navigator (1394-1460), was one of the first Portuguese to navigate these cultural networks in the age of exploration. Pedro traveled extensively in Europe from 1425 to 1428 and, on his way back to Lisbon, managed to bring from Venice a manuscript book by Marco Polo. But it was in the sixteenth century, partly due to the dynamic cultural policy of King João III (r. 1521-1557), that the number of Portuguese traveling and studying in Europe grew dramatically. “Geographies of Knowledge” intends to underscore the impact on European thought of a group of Portuguese intellectuals and their work in a variety of fields, from history and botany to mathematics and nautical science. 19. 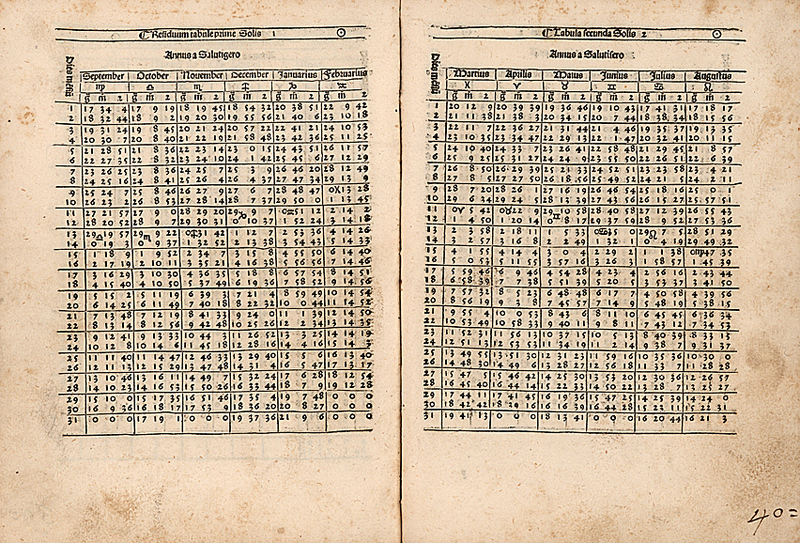 Astronomical tables in Abraham ben Samuel Zacuto, Almanach perpetuum, Venice, 1502. 20. 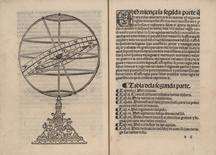 Armillary sphere in Francisco Faleiro, Tratado del esphera y del arte del marear, Seville, 1535. 21. 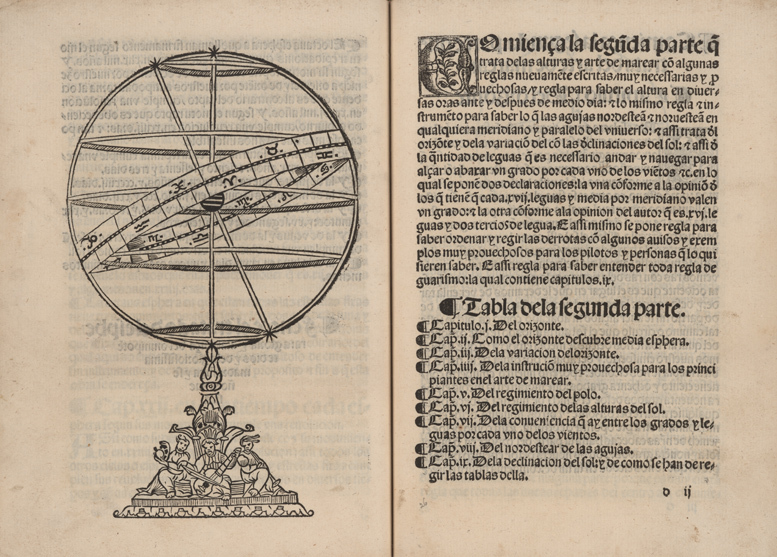 Pedro Nunes, Tratado da spheracom a theorica do sol & da lua..., Lisbon, 1537. 22. 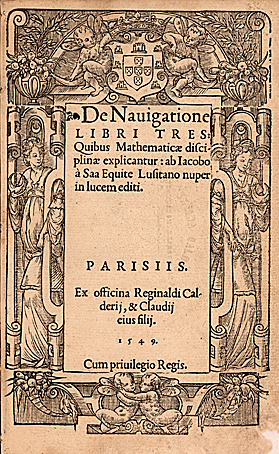 Diogo de Sá, De Navigatione libri tres, Paris, 1549. 23. 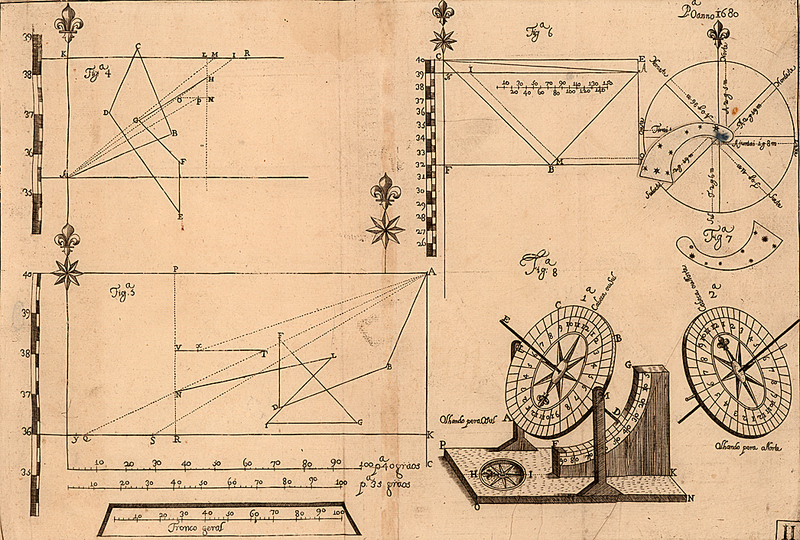 Navigation calculations in Luís Serrão Pimentel, Arte pratica de navegar e regimento de pilotos, Lisbon, 1681. 24. 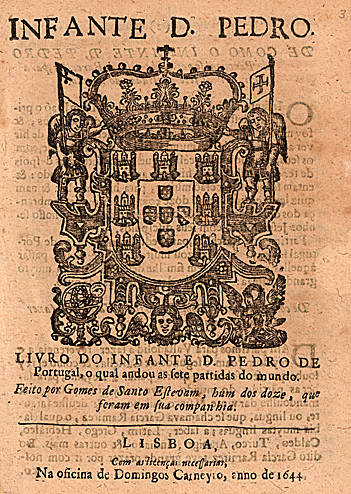 Gómez de Santisteban, Livro do infante D. Pedro de Portugal, o qual andou as sete partidas do mundo, Lisbon, 1644. 25. António Pereira, [North and South América, ca. 1545], manuscript. This map is one of the earliest to show the results of Spanish exploration of North and South America. 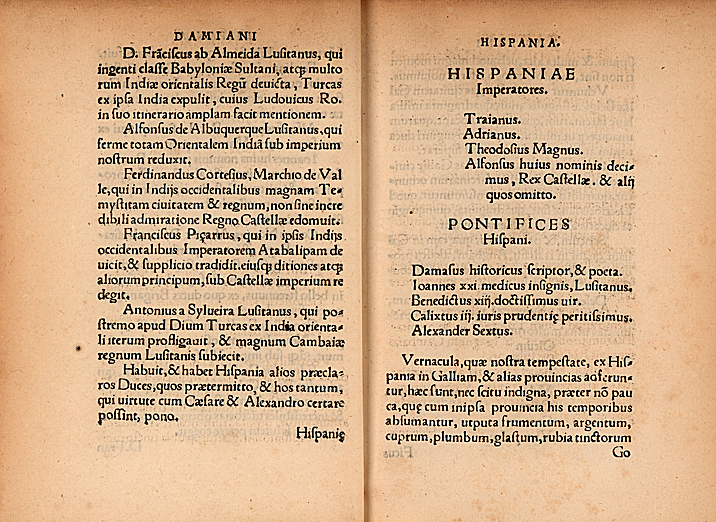 Francisco de Orellana's expedition of 1539 to 1542 is shown in South America. Orellana began his voyage at Quito, traveled across the Andes to the headwaters of the Amazon, and was the first European to make the descent of the Amazon River. He named the river after the Amazons of Greek myth after he and his men encountered a tribe of women warriors. 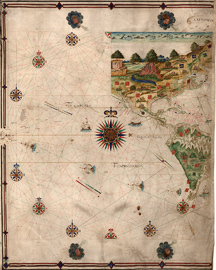 This map has been attributed to António Pereira, a Portuguese seaman, and was originally in three parts (the other two parts have not been found). 26. 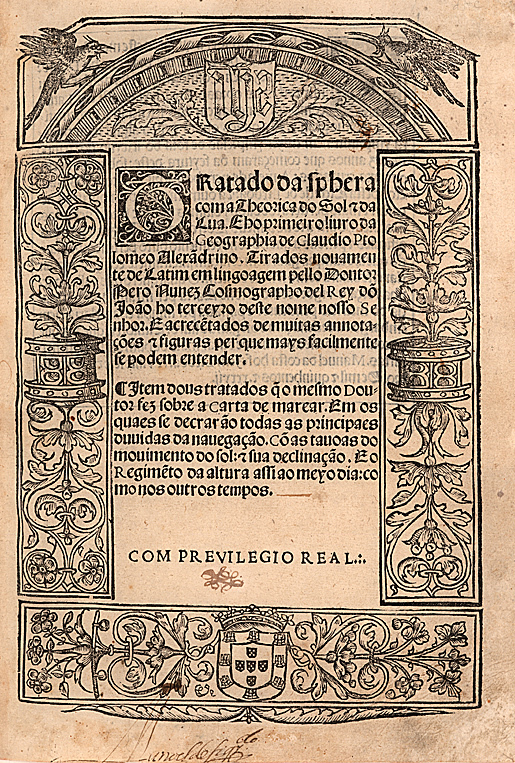 Gaspar Barreiros, Chorographia de alguns lugares que stam em hum caminho, Coimbra, 1561. 27. 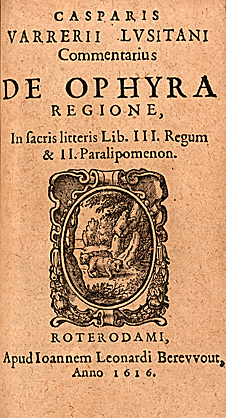 Gaspar Barreiros, Casparis Varrerii Lusitani commentarius de Ophyra regione..., Rotterdam, 1616. 28. 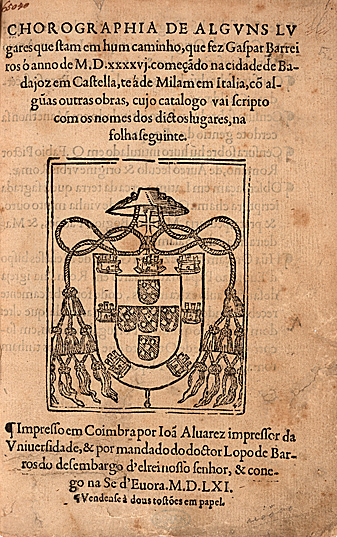 Damião de Góis, Hispania, Louvain, 1542. 29. Johannes Boemus, Mores, leges, et ritus omnium gentium, Louvain, 1561. 30. 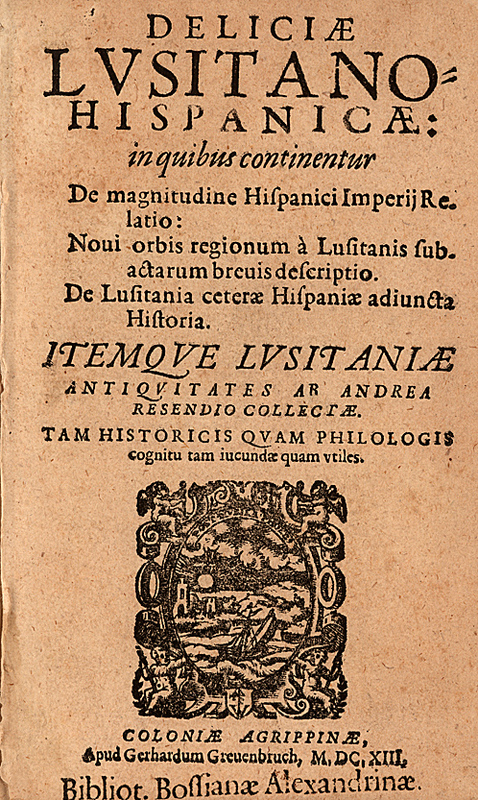 André de Resende, Deliciae Lusitano-Hispanicae..., Cologne, 1613. 31. 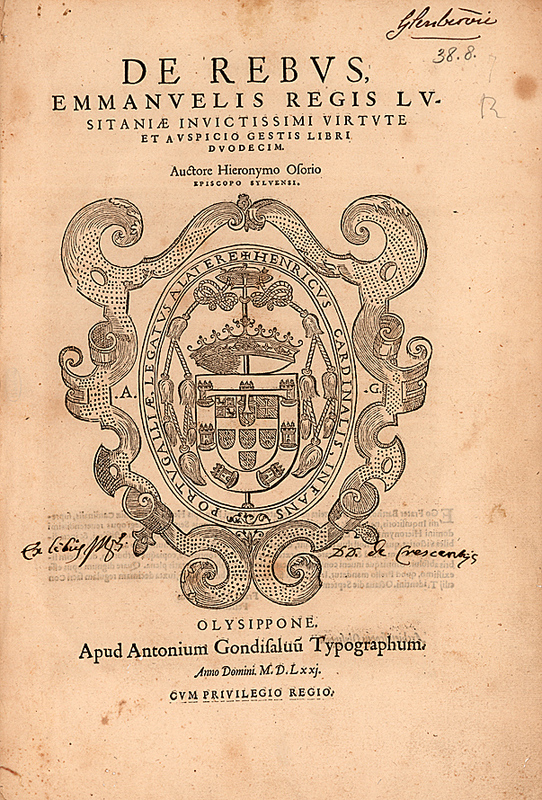 Jerónimo Osório, De Rebus Emmanuelis regis Lusitaniae..., Lisbon, 1571. 32. 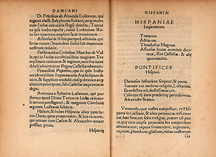 Jerónimo Osório, Hieronymi Osorii Lusitani, Siluensis in Algarbiis episcopi; de rebus; Emmanuelis regis Lusitaniæ..., Cologne, 1574. 33. 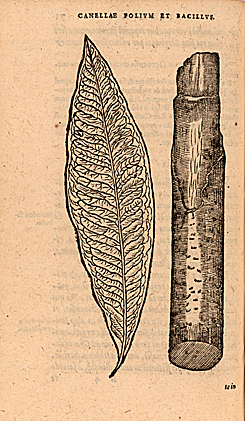 Cinnamon bark in Garcia de Orta, Aromatum, et simplicium aliquot medicamentorum apud Indos Nascentium Historia, Antwerp, 1567. 34. 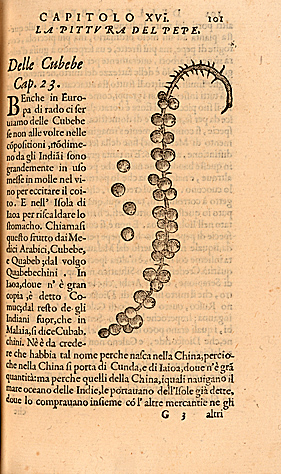 Peppercorns in Garcia de Orta, Dell’ historia de i semplici aromati, el altre cose che vengono portate dall’ Indie Orientali pertinenti all’uso della medicina, Venice, 1589. 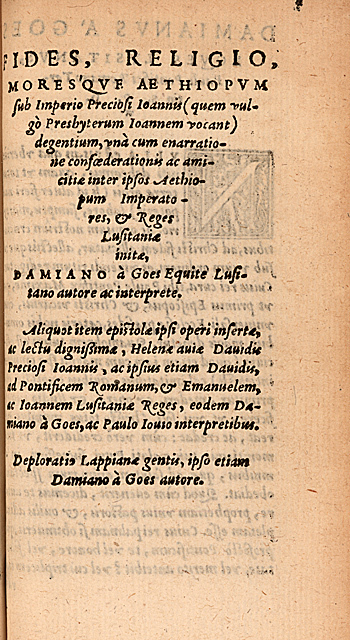 This is the first edition of the Latin translation of Portuguese physician Garcia da Orta’s masterwork, Colóquios dos simples e drogas he cousas medicinais da Índia (1563). Orta was professionally active in Portuguese Asia for over three decades (1534-1568). By interacting with Hindu and Muslim medical practitioners in India, Orta learned detailed information about indigenous healing practices and the application of local medicinal plants, which he codified and published in the Colóquios. 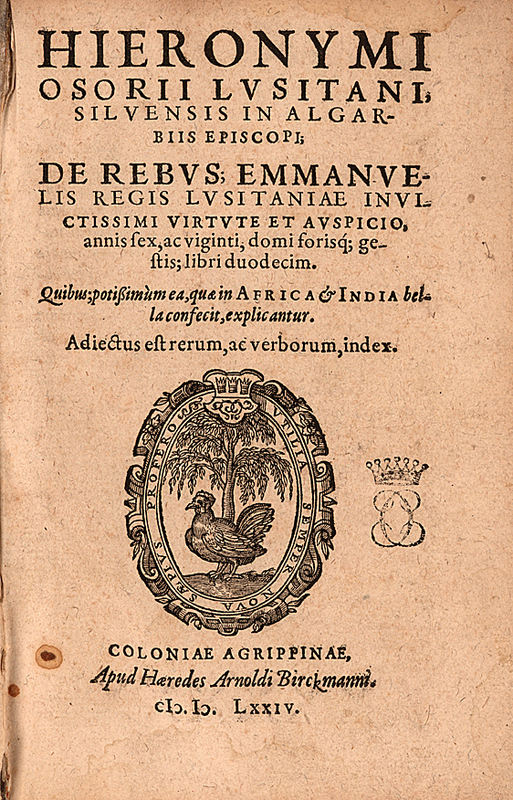 The original text, printed at the Rachol Seminary in Goa, India, was the second European book published in Asia. As the first textbook on tropical medicine and Indian materia medica written by a European, this work would transform the Western understanding of and appreciation for Asian medicine. Publication of Garcia da Orta’s text excited great interest among Europe’s educated elite. 35. 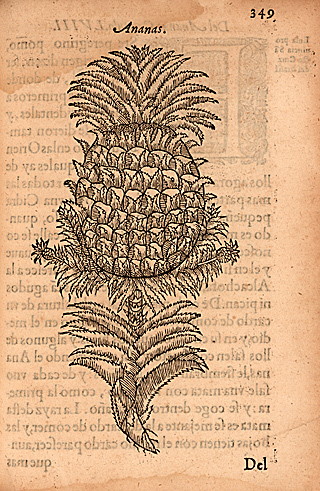 Pineapple in Cristóvão da Costa, Tractado delas drogas y medicinas de las Indias Orientales, Burgos, 1578. 36. 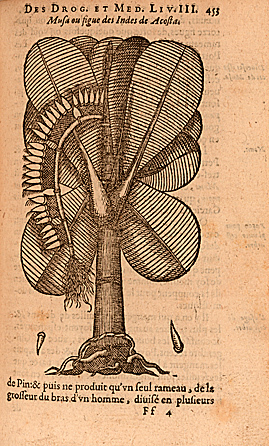 Banana palm in Cristóvão da Costa, Traicté de Christophe de la Coste..., Lyon, 1602.